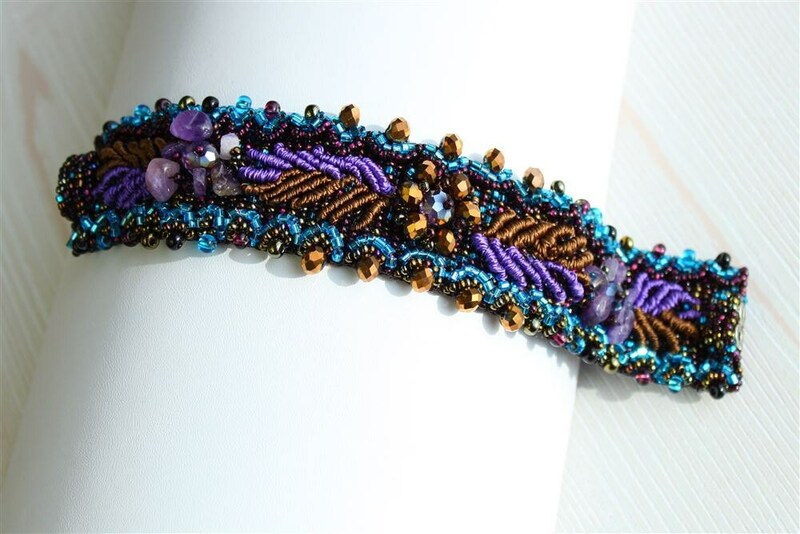 Hand beaded purple turquoise bracelet is entirely handmade. It is 7 inches long and 1.25 inches wide. It is very light weight and has a double magnetic clasp. No fuss since no loop closures. You will love using it for many years to come. Total time to reach you anywhere in the USA: 3 to 5 business days including handling time. 3 business days to the Midwest and 4 business days to the East Coast. Very quick delivery! International clients please allow 2 weeks for delivery. Please contact us if you need more than what is listed or you want to buy wholesale. If you buy at least 5 assorted necklaces or 5 assorted bracelets, we can give you a wholesale price. We have been in business for over 30 years so you can trust us. We started on etsy in November 2011 so you can now see our feedback! You will be delighted with our quality and our customer service!